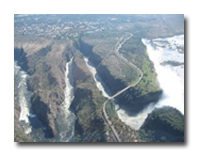 The recent geological history of Victoria Falls can be seen in the form of the gorge below the falls. The basalt plateau over which the Zambezi River flows has many large cracks filled with weaker sandstone. The largest cracks run roughly east to west, with smaller north-south cracks connecting them. The falls have been receding up stream over the last 100 000 years, eroding the sandstone-filled cracks to form the zig-zag chasms which are called the Batoka gorges. The present river’s course in the vicinity of the falls is north to south, and therefore opens up the large east-west crack across its full width, then cuts back through a short north-south crack to the next east-west one. Past sites of the falls are the Second to Fifth and the Songwe Gorge representing where they fell into one long straight chasm as they do now. Their sizes indicate that the waterfall will one day be wider than the present day waterfall. The waterfall has already started cutting back the next one, at the one side of the Devil’s Cataract. This a large east-north-east line of weakness across the river, and that is where the next full width falls will form. Victoria Falls is the biggest curtain of falling water in the world, forming the most remarkable feature of the Zambezi River. The whole volume of the Zambezi River pours through the First Gorge’s 110 meter wide (360ft) exit for a distance of 150 metres (500ft), it then enters a zigzagging series of gorges. The water entering the second gorge makes a sharp right turn and has carved out a very deep pool which is known as the Boiling Pot. The Boiling Pot gets it name from the enormous, slow swirl and heavy boiling turbulence during the high water this part of the canyon measures 150 metres across. The Boiling Pot may be accessed from the Zambian side down a steep path but the view back up the falls is well worth the climb. Objects that are swept over the falls like hippos, elephants and even some bodies are often found swirling around the Pot. The walls of the chasm are nearly vertical and generally about 120 meters high, but the level of the river in them varies by up to 20 meters between wet and dry seasons. •	Songwe: 5.3 km south, 3.3 km long, the small Songwe River coming from the north-east, and the deepest at 140 m (460 ft), at the end of the dry season. •	Batoka: the gorge below the Songwe is called the Batoka. It is about 120 kilometers long (the straight line distance to its end is about 80 kilometers east of the falls).